Credit Line: Collection UCLA Grunwald Center for the Graphic Arts, Hammer Museum. Corita Kent Bequest. Inscriptions: u.r. handwtitten in ink: "3"; c.l. handwritten in ink: "tangerine toner (Sherwin Williams - Sher - will - glo)"; c.r. handwritten in ink: "green to match print attached (please return print)"; l.r. handwritten in ink: "Why do you not think of him"
"Untitled." Corita Kent in the Grunwald Center Collection. 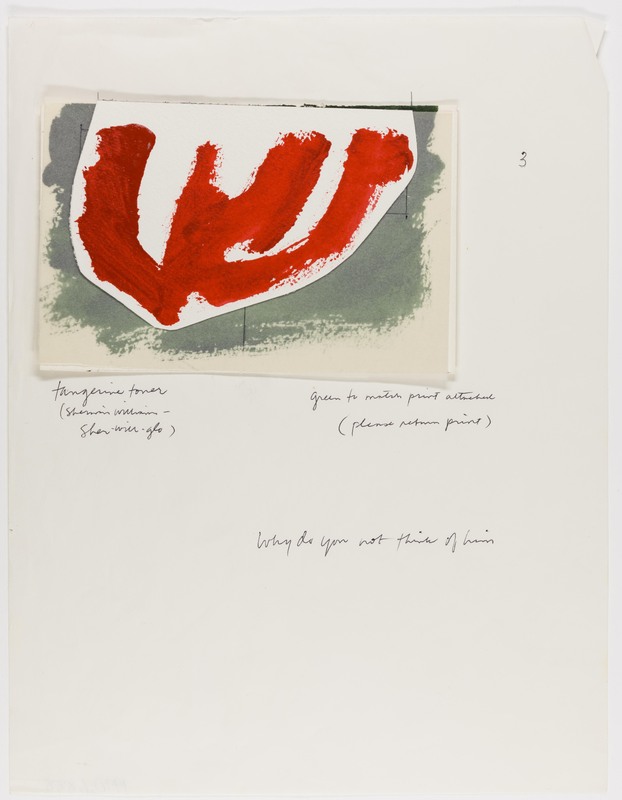 Los Angeles: Hammer Museum, 2017. https://​hammer.ucla.edu/​collections/​grunwald-center-collection/​corita-kent/​art/​untitled-preparatory-material-for-why-do-you-not-think-of-him/​.